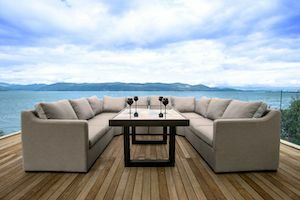 Your outdoor area is incomplete without a nice sofa set. Outdoor sofas can really make a statement which is why you should update your garden space now. Looking for sofa sets that are a bit unusual? Stylish outdoor sofas from Maze Dubai can make your property look even more gorgeous. Maze Rattan Furniture supplies you with top-notch outdoor sofa items to give your place that luxurious look. Unwind in comfort and style with the beautiful Winchester expansive corner sofa set. 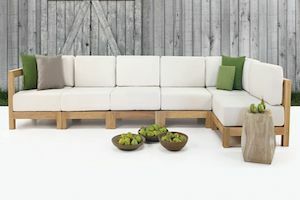 These outdoor modular sofa sets are super stylish and would look great on any porch or garden space. Once a sofa set is installed in your garden it can be clasped together to ensure the adjoining pieces don’t move away from each other. Winchester sofa sets have additional thick cushions on the back and base to add a comfortable dazzling option to any garden or terrace. 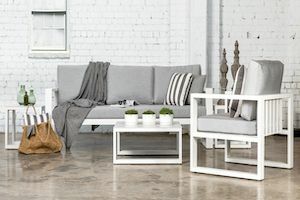 Unwind in comfort and style with the Rehau square sofa set. These sofa sets are weaved with top of the line German REHAU rattan which comes with a 3 year warranty against fading or breaking for peace of mind. 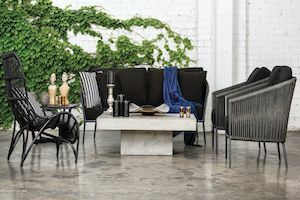 With its smooth lines and contemporary looks, these sets will make a dazzling accompliment to any outdoor area and is perfect for relaxing and unwinding. All the table come with tempered glass for added safety. The Flex plan from Divano Lounge changes the way we look at furniture. With cushions upheld by textured straps rather than strong metal, another level of comfort is reached. The low hung seats and over-stuffed back pads guarantee that comfort is ensured. The Divano range is built with Sunbrella fabric that can be left outside for long periods of time without any worries about fading or changing colour. Divano Lounge items can be left outside all year round, and are easily cleaned soap and water. Upgraded by the Burmese Teak base that the delicate, extravagant sofa sits on, this makes an exceptionally a la mode set. This set is covered in Marine microfiber leather. All Divano Lounge furniture is hand crafted with a wide-cell structure to boost wind current, permitting the furniture to dry rapidly, without catching pockets of water. 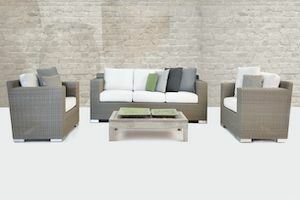 These outdoor garden sofa sets can not only be used for decks but they also make good furniture for gardens as well. Maze Rattan Furniture provided you with everything you desire for your commercial or personal use. Check out the collection now and pick the one that suits your place the best.